UCF just continues to win and stays atop the rankings again this week. Fresno State, Army West Point, Utah State, and Buffalo round out the Top 5 this week. Buffalo (who already won this week) moves up to #5 . Houston was in the Top 5 but lost to Tulane this week to drop out of the Top 10 to number #11. 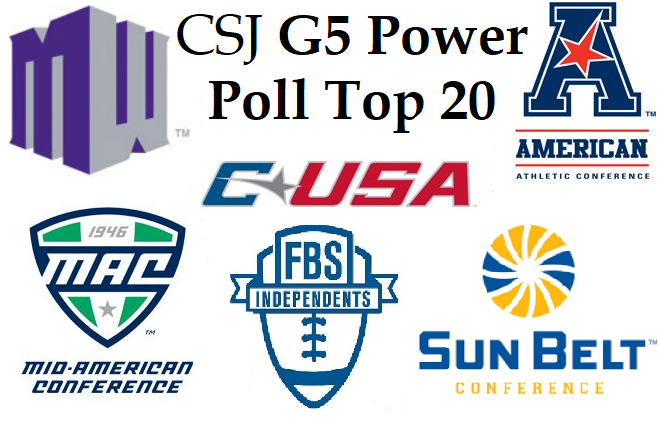 Boise State, Cincinnati, Appalachian State, San Diego State, and UAB all won and move up into the Top 10. Marshall and Florida International move out of the Top 20 with losses and are replaced by Middle Tennessee State and Louisiana-Monroe. See the full Top 20 below with the results from last week and those team’s opponents this week.